After losing Hanah, we have been looking for a puppy. I love the look and smarts of Belgian Tervurens, but they can be rather demanding of exercise and attention. Hanah was a rather hyper German Shepherd (GSD) because she was originally from Czechoslovakia lines, which are working dogs a bit on the smaller side of the breed. We tossed it back and forth between a Terv and a GSD, but breeders are fewer for Tervs and I finally decided to it would be better if we had the calmer-temperamented GSD. I was not in a big hurry to get another dog, because I still have not finished the master bathroom. I have been kind of under some emotional strain of late as you might understand from my previous post. However, it is also because of that emotional strain that we decided we need some REAL puppy love in this house hoping it would be therapy for all of us, but especially the Princess. My husband found a wonderful breeder about three hours south of us. Yes, there are other breeders closer with available dogs, but my husband is quite particular about not just the dog, but from whom the dog comes. We wanted a male with the plush or rough coat, which has longer hair than the stock coat. Our first GSD, Sasha, was a rough coat. This breeder had two males left both with rough coats. We drove three hours one way to see the two puppies about two weeks ago on a Sunday. They were about six weeks old. One had a teal ribbon on his collar and the other, green. They had been outside in a moveable pen so all six were let out. We watched them together and how they played with each other and the toys. One kept catching my eye more than the other. The teal one seemed to be just as happy playing with a toy by himself as being with the others. The green seemed to just like everything but not anything particular thing and was maybe a bit more cuddly. The sun's position made it time to take them inside. Being so young, then they mostly wanted to sleep. However, the teal one would try to stay up and play. I watched him struggle against his sleepiness three times, lying down and then going back to a toy, before he gave up completely and the green just succumbed as soon as he found a cozy spot in the whelping box. Guess which one we all picked? I like cuddly but these males will be about 85 pounds full grown and we want a loving but well-trained, protective dog. So, after handing the breeder our money to hold the cute teal one with the stronger drive, we stopped to eat and started on names. For the AKC registration, we have to pick a name that began with "F," because he was in the F litter. (It's a breeder / records standard thing.) We could, of course, have a completely different call name. For the papers, we decided on Fenris, a Norse mythological monster wolf. I just think he would be every canine's dream hero. We thought about using the same name for his call name but everyone had other ideas. The breeder was anxious for the call name, knowing we did not like Frankie as she had been calling him for training. Oh, yeah...training. At six weeks, her puppies have learn the German commands, as done in Schutzhund training (now called IPO), for sit, lie down, come, and here. Our last two dogs were trained in Schutzhund commands well, but Hanah actually was formerly trained and passed Level 1 trials. We discussed, laughed, got frustrated, and argued over names for a few days. Hanah was already named and at six years old and we actually liked the name, so we kept it. Sasha was just the perfect name that my husband and I both liked, and because it was so perfect it has been a greater challenge to find a another really good one. Sasha is a Russia male name derived from Alexander which means "friend and defender of men." I looked at all the other variations of Alexander but none really stood out. We found it funny that most Americans think of Sasha as a girl's name here, even my mother-in-law referred to him as "her" for the first few years. Mishka is a Russian name deriving from Michael, meaning "Who is like God?" In Russia, it is used for both boys and girls...and something else: here we have the teddy bear, there they have the mishka. It is also a term of endearment in Russia. You may have heard in a movie "my little mishka." I knew it was not the top three picks for my husband but I thought he might get to like it more because we have pet names for each other and his is T.B. (for teddy bear). There are a few other cultures that use Mishka as a name. In Hindu, it means "gift of love." In Arabic, it is "light of the candle" or "illuminator of knowledge." We just cannot go wrong with this name! We have been receiving pictures and updates every few days. One thing the breeder-trainer told us is that Mishka pays a LOT of attention when being given commands. We knew he was the one! 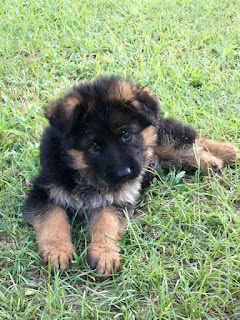 We made arrangements for picking up Mishka on Labor Day, but it worked out that Sunday was better for the breeder, although it is two days short of the eight week age, which she prefers. Yes, we will be skipping church, but we just cannot wait for our little Mishka! Thank you, my Lord, for this young life that will grow to be our protector and our friend. We are looking forward to the years of companionship he will bring to our lives. Are you saying you were familiar with the names previous or that you "knew"? I was familiar with the names previously.